Terry Wingate was born in Sarasota Florida and spends a few months each year in his mountain cottage near Sevierville, Tn. My game was golf, however, I'm totally hooked on Pickleball. What a great game for exercise and meeting new friends. I'm trying hard this summer to start night play in Sarasota to give folks that are still working a shot at this great game. 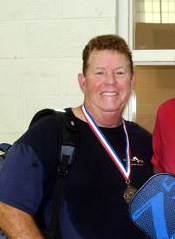 Happy to be on the Ambassadors team to promote pickleball.